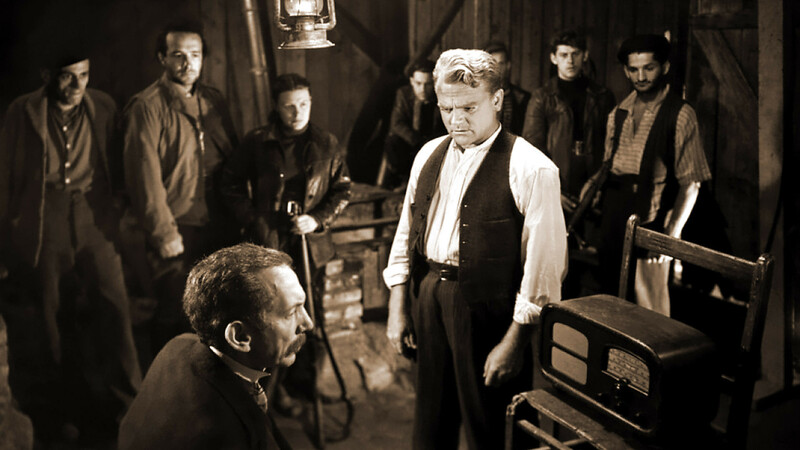 James Cagney (centre, illuminated) works with the French Resistance. Have you ever dreamt of becoming a secret agent? We (as in, yours truly) could never handle the life of a spy. It sounds far too stressful. We realized this while watching the WWII spy thriller, 13 Rue Madeleine (1947). To be a good secret agent you need to come up with credible lies quickly, and then remember them later on. Noooo, thank you. We ain’t that clever. Instead, we’ll just enjoy movies about secret agents, like the fast-paced 13 rue Madeleine. The title refers to an address in the city of La Havre where, according to the film, the Gestapo headquarters are situated. This building is never shown, only its iron gates, which adds an element of creepiness. The only other part of the building that is shown is a sparse, plain room in the basement that is used for torture. The movie begins as a documentary-style film on how to become a secret agent. Seventy-seven people are selected to be trained as agents, and they are taken to a training facility near Washington, DC. This group learns offensive and defensive tactics, morse code, and how to lie if they’re caught going through someone’s office. You know, the usual spy stuff. James Cagney stars as Robert Sharkey, a scholar and master linguist. He trains this particular group of students to be super spies before they are shipped to Europe for various espionage assignments. However, there is a glitch: one of the students is a Nazi agent. Not only must Cagney must find out who it is, he must give this person false information about the Allies’ D-Day plans. Cagney realizes that the Nazis are relying on this agent to retrieve valuable information about the invasion. As soon as the agents are put on a plane to cross the English Channel, the movie kicks into high gear. This is no longer a documentary; this is now a first-rate spy thriller, where you find yourself talking out loud to the movie. (We actually said things like, “Oh no!” and, “Don’t go up there!”) The scene on the plane is incredibly tense; it is so good you’ll want to watch it twice. Once those agents parachute from the plane, the movie becomes a hang-onto-your-hat ride with a sudden, shocking finish. 13 Rue Madeleine doesn’t claim to be based on a true story. However, there really was a top-secret organization called the OSS (Office of Strategic Services) that was created during WWII and is regarded to be the forerunner of the CIA. The OSS sent spies all over the world during WWII to form a global intelligence network. It is also true that the Allies “leaked” false information about the D-Day invasion. Cagney is really good as the super-smart spy instructor, but so is Richard Conte who plays one of Cagney’s students. The French actress, Annabella, was given second billing but her role is too small; her character’s story would make for a fascinating movie in itself. Also watch for Karl Malden, E.G. Marshall and Red Buttons in uncredited roles. If you’re in the mood for a realistic spy thriller (where agents rely more wits than electronic gadgets), you might want to see 13 rue Madeleine. It will also give you a chance to see if you’d like to fulfill your life-long dream of becoming a Secret Agent. 13 Rue Madeleine: starring James Cagney, Annabella, Richard Conte. Directed by Henry Hathaway. Written by John Monks, Jr. and Sy Bartlett. 20th Century Fox, 1947, B&W, 95 mins. Previous Spencer Tracy, I Presume? I love, love, love this movie. Of course, I will watch James Cagney in anything. He’s my favourite redheaded guy, other than my husband. I’ll watch James Cagney in anything, too. He was credible in all his roles. Here’s to redheads! Exactly. How CAN a spy be secret if s/he is always creating chaos? As for Cagey, he makes this terrific movie even better. I really like Cagney in this film, and he has a GREAT final shot, in the torture room you mentioned. Seeing that, I agree, the life of a spy is definitely not for me! That is a great final shot, isn’t it? I was not expecting that. It still gets me, every time I see it. Ruth, you had me at “We actually said things like, “Oh no!” and, “Don’t go up there!” Your review alone had me at the edge of my seat. While I enjoy James Bond movies, I also love docu-thrillers like THE MAN WHO NEVER WAS, so 13 RUE MADELEINE sounds like my kind of movie! Great post; loved the trailer, too, BTW! Thanks for stopping by, Dorian. 🙂 “The Man Who Never Was” is a movie I have yet to see. If it’s similar to “13 Rue Madeleine”, I’ll love it! I seriously follow your blog for the recommendations. 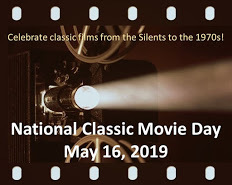 I used to consider myself a cinephile, but so many films you’ve reviewed have flown under my own radar, so I am relinquishing my cinephile moniker, for the time being. I need to earn it back. I’ve yet to really find a bad Cagney film or, at least, a bad Cagney performance. No no no – don’t you dare give up your cinephile moniker. You’ve probably seen lots of movies that I haven’t. For example, I have never seen “Dr. Zhivago” and I think I have yet to sit through the entire 1959 version of “Ben Hur”. As for James Cagney, I completely agree. I can’t think of one bad – or even mediocre – performance he’s given. Truly one of the best. Great posting! I love James Cagney too and indeed it was really him who got me completely hooked on classic movies a few years back, as I ferreted out all of his films and then became increasingly interested in other actors and directors along the way. If I remember rightly, a special pleasure in this movie is how many languages he speaks – I believe he does a whole scene in French, in addition to his great spoken German.Must admit I have seen one or two pretty bad films with him in them, such as ‘Never Steal Anything Small’, but his performance is always great. Getting back to ’13 Rue Madeleine’, it is certainly a very tense and atmospheric film and the ending is unforgettable. That’s interesting, how you became interested in classic film by way of James Cagney. How did you happen to come across him in the first place? Was there a particular movie that hooked your interest? It was ‘Public Enemy’ – I saw an episode of ‘The Sopranos’ where Tony was watching it, which featured a couple of the greatest clips. It’s still one of my favourite Cagneys, along with ‘White Heat’, ‘The Roaring Twenties’, ‘The Strawberry Blonde’ and quite a few others. ‘Public Enemy’ also got me interested in director William Wellman at the same time! I had liked some classic films before that, but it gradually became more of an obsession, I suppose. Ooooh!! This sounds very interesting! I love coming over here and finding movies I’ve yet to see. I really appreciate that! I’m ashamed to say I’ve never seen a Cagney movie, but this one just moved to the top of the “must see” list. Love this post, thanks so much! You’re in for a real treat when you see your first Cagney movie. You’ll immediately see why he became a legend. I think my all-time fave Cagney movie is “White Heat”, but he is terrific here too. This movie has an incredible, shocking ending. Cagney was one of Hollywood’s most versatile performers ever. This is a stand-out performance. It’s been a long time since I saw this film and I am shocked to see that it isn’t in my collection. I will have to fix that problem soon. When it comes to being a spy, I have come to the decision that spies don’t have enough time to watch movies, and so I will have to pass on that particular job. I agree with you completely re: being a spy + no time to watch movies. Anyone who chooses that life is far more self-sacrificing than I. My favourite husband, who is always on the lookout for old movies, found this DVD in a discount bin! Can you believe it?! Me too – I’d take James Cagney as a secret agent over Doug McClure any day! I really loved the final scene with Cagney “laughing at death” in this movie. I have seen and own all of James Cagney’s films. The only film I could never watch again would be A Midsummer Night’s Dream. Just too silly for me. My favorite Cagney films include: Yankee Doodle Dandy, Angels With Dirty Faces, The Strawberry Blonde, G-Men, The Fighting 69th, City For Conquest, One, Two, Three, Love Me Or Leave Me, and Each Dawn I Die. Like EG Robinson Cagney was unfairly stigmatized a gangster actor. Cagney and Robinson were so much more. They could play anything. Cagney was a stand-up guy who was married to his wife “Bill” for more than 60 years. What I liked most about Jimmy was he was no phony. I wonder if you ever have seen his AFI award complete, one hour and 20 minutes long that includes his speech? I have not seen the AFI piece, but I’ve just put it on my list.